So as you can see, this will quite often cause some confusion as to what you are actually getting when you order an SEG Popup Display. There are many people around who when they order a 3×3 SEG Popup Display, they are actually expecting a 3 METRE wall. This is in fact not the case as the size is determined by the number of units, not the physical length of the Wall. 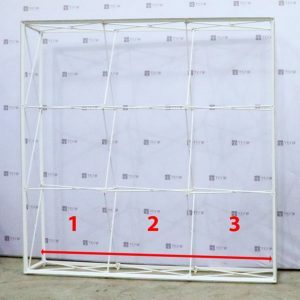 Continuing with the 3×3 example, the 3×3 Pop-Up SEG wall actually measures to 2.24m x 2.24m. Well, the sizing of each section is approximately 74.6cm, so to get the right size simply multiply this number by the number of sections in the row (or column). Or… you can look at the true sizes of all our Standard SEG walls by heading over to the website. There, you can check out how big the walls are for our items such as the 3×3, 3×4, 2×3 etc. Click Here: https://tenji.com.au/product/seg-pop-up-walls/ to check them out! Make sure that when you’re placing your order that you know exactly what you are getting, the Last thing we would want is for you to find out that you’ve got the wrong size AFTER you’ve already received your order! If you still aren’t sure if you’ve got it right, all you need to do is contact one your amazing account managers at Tenji and they will gladly walk you through your ordering process to ensure that you’re getting the right product for you! Check out this video explaining the sizing of our SEG walls!